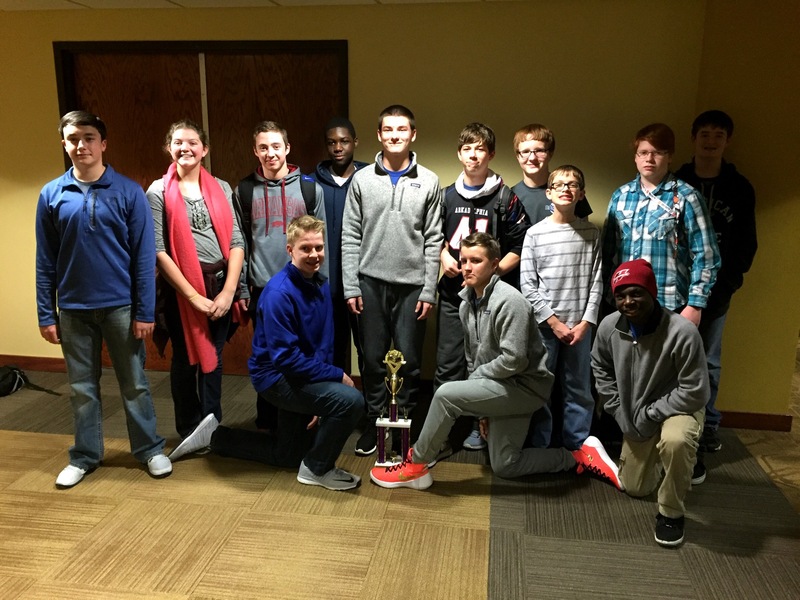 Congratulations to the Goza Middle School 8th Grade Quiz Bowl Team for taking first place in the 2016 AGQBA 4A Regional Tournament at Henderson State University on January 26, 2016. Seven teams competed from around the region including: Mena, Malvern, Fountain Lake, Nashville, Ashdown and Arkadelphia High (9th). Patrick Hayes earned honors to the All-Tournament Team. Nashville took second place with AHS (9th) placing third. Goza will advance to State Finals at Morrilton, Ark. on Feb. 27. The Goza team members include: Sydney Motl, Cannon Turner, Cole Turner, Patrick Hayes, Cabb Batson, Lunden Cotton, Ian Manning, Yebo Moya, Caleb Cornelius, Alex Carter, Lucas Witherspoon, Malcom Turner, and Wyatt Forthman.